Kiawah Island is a unique and beautiful retreat just off the coast of Charleston, South Carolina. What makes Kiawah unique? First, Kiawah Island has one of the few beaches on the East Coast that runs east-to-west and actually faces south. Nestled in this harbored area where the coastline cuts inward, the surf on Kiawah is almost always gentle and calm. Second, the Kiawah Island Golf Resort owns the majority of the Island including the only hotel on Kiawah, the Five-Diamond rated Sanctuary Hotel. The Resort has carefully controlled development on the Island, limiting encroachment of commercial activity. This has created a one-of-a-kind pristine environment lush with a maritime forest and native wildlife. You will find no fast food chains, no outlet malls, nothing to mentally pull you out of the cocoon of coastal beauty that is Kiawah Island. 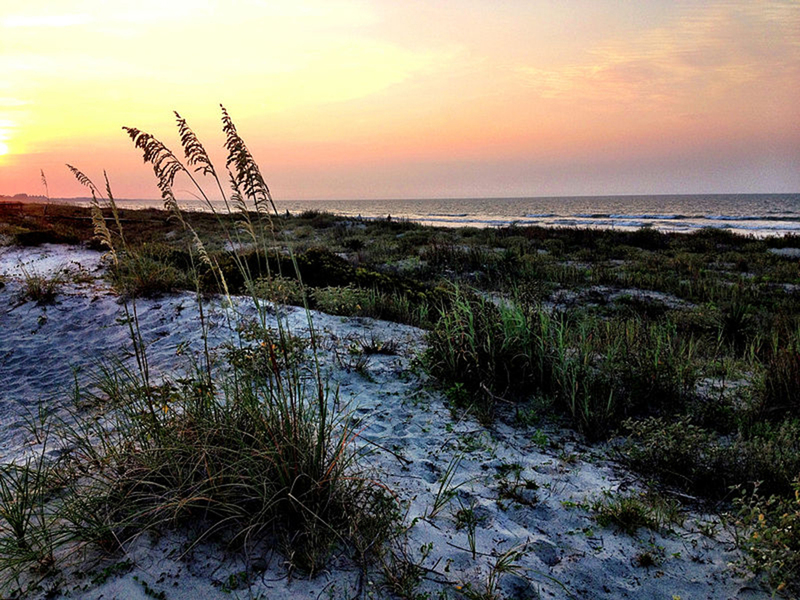 To begin enjoying your vacation on Kiawah Island, you will first need to plan where to stay. If you are looking for luxury and elegance, The Sanctuary is a must. This five-diamond hotel was completed in 2004 with intense attention to detail. It is beautifully decorated and offers every comfort plus two excellent restaurants, the Ocean Room Prime and the more casual Jasmine Porch. For a more private, laid-back Kiawah experience, though, you can rent a villa instead of staying at the hotel. The Resort rents out villas ranging from small condos to elegant, oceanfront mansions and everything in between. Some private home owners on the Island rent out their homes to guests who elect not to stay with the Resort, but be aware that if you do not rent through the Resort you will not have access to a pool or to the Resort's activity programs. Once you have a place to stay, you need a place to eat. For a special occasion, the Sanctuary's Ocean Room Prime is a great choice. This upscale steakhouse has spectacular views of the ocean and the service will make you feel like royalty. If you're looking for more casual everyday dining, head up to Freshfields Village at the entrance to the Island. This new town center offers several restaurants featuring French cuisine, pizza, burgers, and paninis. At Vincent's Pharmacy, you can also get an old-fashioned malt or ice cream. If you're renting a villa, be sure to stock up on groceries at Newton Farms grocery store in Freshfields. You'll also find fresh produce and seafood just down the road at Rosebank Farms. Rosebank Farms is a reminder of “old-Kiawah.” This rustic farm turned menagerie and museum offers fresh seafood and vegetables, works by local artists, and, for feeding and petting, barnyard animals including cows, horses, goats, rabbits, and chickens. It's always a big hit with children! With your hotel and dining options in mind, you're now ready to play and Kiawah offers plenty of fun. First and foremost, Kiawah is a golfer's paradise. Kiawah Island's five golf courses are renowned throughout the world for their quality, challenge, and views. In 2012, Kiawah hosted the 94th PGA Championships on the Ocean Course. While green fees aren't cheap on Kiawah, for the avid golfer the experience is hard to top. When you're not golfing, Kiawah offers world-class tennis facilities as well as a number of activities to help you explore the Island's natural beauty. Kayak tours, walking nature tours, boat excursions including dolphin sighting trips and biking are all great ways to get you into the natural environment. If you brought kids and are looking for a little reprieve, the Resort offers Kamp Kiawah, youth programs, and teen programs to keep your kids active and having fun while you relax. The best Kiawah attraction, though, is the Island's remarkable beach. Wide and flat with firmly-packed sand, the beach is perfect for relaxing, biking, jogging, or tossing a Frisbee or ball around. Another benefit of having only one hotel on the Island is that Kiawah is almost never crowded. You'll have no trouble finding a private spot to set up your towels or beach chairs. On a final note, Kiawah Island is just a forty minute drive from the beautiful and historic port city of Charleston, South Carolina. Charleston's architecture, history, attractions, and world-class restaurants make it well worth a day's exploration or even a side trip from your Kiawah vacation. Kiawah Island is the right spot for your vacation if you're looking for pristine coastal beauty, quiet elegance, and an escape from the outside world. The Island offers a unique and beautiful retreat that can be tough to find these days, but oh so relaxing when you do!